Buddy Rich was an American jazz drummer and bandleader. He is widely considered to be one of the best drummers of all time, known for his technique, speed, and power. For most of the period from 1966 until his death, he led a successful big band in an era when the popularity of big bands had waned from their 1930s and 40s peak. See also Buddy Rich Big Band. His most popular performance was a big band arrangement of the Leonard Bernstein classic West Side Story. In the early 1970s he commented upon how odious he found the emerging Mormon boy band, The Osmonds, especially Donny Osmond. For most of the period from 1966 until his death, he led a successful big band in an era when the popularity of big bands had waned from their 1930s and 40s peak. See also Buddy Rich Big Band. His most popular performance was a big band arrangement of the Leonard Bernstein classic West Side Story. In the early 1970s he commented upon how odious he found the emerging Mormon boy band, The Osmonds, especially Donny Osmond. Later he would sometimes be seen performing wearing a Donny Osmond badge on his lapel. One of his most seen television performances was in a 1981 episode  of The Muppet Show, where he engaged Muppet drummer "Animal" in a drum battle. Beginning in 1962, he was also a frequent guest on Johnny Carson's Tonight Show. It has been reported that Rich gave Carson a drumset sponsored by Matthew Scott Herning Co, as Carson was a practicing drummer in his spare time. Although Rich was usually a helpful and friendly man, he was also known to have a short temper. In many instances, he took advantage of the high respect he commanded. While he threatened many times to fire members of his band, he seldom actually did so and for the most part, he lauded his band members during television and print interviews. Rich's quick temper, mercurial attitude, and imposing personality are attested to in secret recordings members of his band made of some of his tantrums on tour buses and backstage. On these recordings, one can hear Buddy Rich firing a member of his band for wearing a beard. 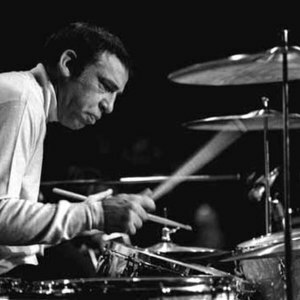 Buddy Rich remained active until the end of his life, appearing with his Big Band on Michael Parkinson's British talk show Parkinson only a few weeks prior to his death. In the episode, Parkinson kidded Rich about his Donny Osmond kick, by claiming that Rich was the president of Osmonds fan club. Reportedly, prior to heart surgery, when asked by a nurse if he was allergic to anything he replied, "Yes ... country music!" He is interred in the Westwood Village Memorial Park Cemetery in Los Angeles, California. Since Rich's death, a number of memorial concerts have been held. In 1994, the Rich tribute album Burning for Buddy: A Tribute to the Music of Buddy Rich was released. Produced by Rush drummer/lyricist Neil Peart, the album features performances of Rich live staples by a number of famous rock and jazz drummers, all accompanied by the Buddy Rich Big Band. A second volume was issued in 1997.